Behold Denzel Washington, thinking, contemplating, considering. The moments when he’s introspecting are many and much more arresting than the clichéd rough stuff served up in this sequel to the 2014 action hit. Rating: 2.5 stars out of 4. Behold Denzel Washington, thinking. Contemplating. Considering. Cogitating. In “The Equalizer 2,” director Antoine Fuqua stands back and lets the big man do his quiet, introspective thing. The plot is negligible. Washington’s character, Robert McCall, doer of good deeds, does very bad things to very bad people who do very bad things to good people. He will break their bones. He will gouge their eyes. He will toss them from heights onto rocks far below. 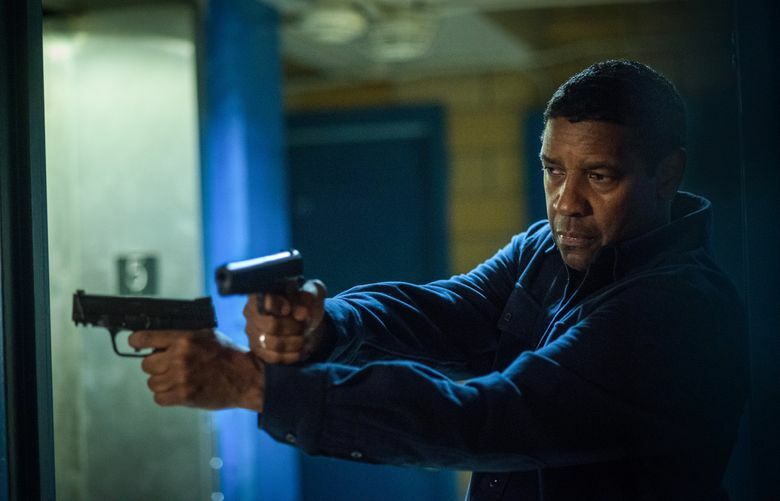 This will be no news to fans of the 2014 original “Equalizer,” and there were a ton of them, enough to propel that picture to a $100 million tally at the U.S. box office. What that man did to baddies with a nail gun and barbed wire, not to mention his bare hands, was very badass. So Washington has been there. He’s done that. He re-established his action-hero bona fides in a manner harking back to his masterly “Man on Fire,” so for the sequel (the first ever in his career), he and Fuqua, who directed him in the original, decided to do something rather different. Toss in the red-meat bash-and-batter enough times to satisfy the genre’s basic demands, but spend much more time presenting him musing. Mulling. Deliberating. It’s arresting to witness the character — who lives a low-profile, solitary existence in Boston — voyaging deep within himself; revisiting his past; silently grieving over the long-ago death of his wife; considering the righteousness of his vengeance; thinking hard how best to help the put-upon, the downtrodden and the abused he encounters in his daily life. They include an elderly Holocaust survivor haunted by the loss of his sister in the camps during the war, a Muslim woman whose urban garden is trashed by vandals and, most significantly, a young aspiring artist (Ashton Sanders) whose brother was killed by gangbangers and who is himself teetering on the edge of falling prey to the harsh life of the street. But it’s his interaction with Sanders’ character, Miles, that is really the heart of the picture. He urges the kid to consider his life choices, encourages his artistic talents and peers deeply into the young man’s eyes with a soul-freezing stare as he quietly tells him to, in essence, straighten up and fly right. Well-considered words to the wise, delivered from the heart. ★★½ “The Equalizer 2,” with Denzel Washington, Pedro Pascal, Ashton Sanders, Melissa Leo, Bill Pullman. Directed by Antoine Fuqua, from a screenplay by Richard Wenk. 125 minutes. Rated R for brutal violence throughout, language and some drug content. Opens July 20 at multiple theaters.